Institute chairman Bill Anderson believes that the Irish Football Association aren’t giving the current promotion play-off situation their ‘full attention’. Anderson, like everyone connected with the Waterside club is frustrated by the current on-going promotion play-off saga which involves Balinamallard United, Warrenpoint Town and Carrick Rangers. The Drumahoe club look set face Ballinamallard United in a promotion play-off after Carrick Rangers escaped any punishment over the then manager Gary Haveron’s touchline ban. Carrick were in the dock over a what the IFA described as a breach of Article 23.1 of its Disciplinary Code. The charge related to Haveron’s presence on the touchline during the club’s victory against Dungannon Swifts on April 23. The sanction for such an offence is a minimum fine of £350 and forfeiture of the match on a 3-0 scoreline. That would have seen Carrick deducted three points which would have left them bottom of the Premiership and automatically down. But following an IFA hearing last Wednesday night it was confirmed that the Rangers would remain in the top flight. The IFA Discipline Committee found “that the interests of justice were best served by not imposing a sanction in all the circumstances”. The statement added that the Disciplinary Committee took into account what it found to be the ‘honest intention’ of the club to serve a suspension, and the fact that three matches had been served. The Committee also noted the points made regarding possible confusion in the way in which the suspension was to be implemented. Since then both Ballinamallard and Warrenpoint have appealed that decision and the whole situation could even end up in the courts. Anderson believes that the hierarchy in Belfast don’t seem to care enough, however he has praised Andrew Johnston, Managing Director of the Northern Ireland Football League. “To be fair NIFL have been keeping me up to date with the situation, the IFA haven’t as much as spoken to me and I’m disappointed in that,” he stated. “I wrote and submitted a letter to NIFL and I sent a copy to the IFA out-lining all the issues and I have spoken to Andy Johnston at the Club Development session at Windsor Park recently and he promised to keep me up date, which he has done. “But I think NIFL are in the strange situation where they run the leagues and they look for the sponsors and so on and so forth, but all disciplinary issues are done by the IFA, so NIFL are kind of having to wait on the IFA to make decisions all the time. The chairman is also worried that some of the young talented group of players at Drumahoe, which Kevin Deery has assembled may be tempted to leave the club for nothing and all the hard work would have to start again. “We have a really great bunch of players, who have all played their part this season and it would be a shame if that squad started to disintegrated because of off-field issues,” he added. “We can’t say to a young lad in our squad to ‘just sit tight and see what happens’, when in actual fact other people are coming to them and saying ‘come play with us in the Premiership next season’ and at the minute that’s the situation which we are in. “But we need to be able to maintain and keep our players if we want to have any degree of sustainability as a top flight team in Northern Ireland. “From the situation which we found ourselves in at the beginning of the season and what Kevin Deery and those boys have managed to achieve has been great. 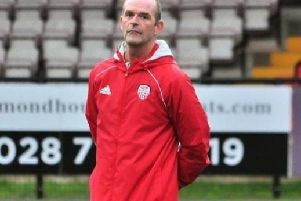 “I just don’t mean a play-off spot, I mean winning the Intermediate Cup, getting to the Craig Memorial Cup final, all of those things that they have done with very little resources and just sheer commitment and determination and now where they are in a position where they should have the opportunity that they have earned to go up into the Premiership, but that rug has been pulled out from under them. “There’s a great possibility that all that hard work will end up in our team disintegrating. In some quarters a 14 team Premiership league has been mentioned and would solve a lot of problems and Anderson hopes every idea is on the table. “I don’t know about the powers that be say like UEFA what their take on it is, but I would have thought that would be a possibility,” he added.